In the late 1980's, a lunatic was on the loose in the NWA. His name was Norman and he wrestled in the clothes he wore after escaping the psych ward. Norman's manager, Teddy Long carried a key to keep his man in line. The key served as a reminder that if Norman didn't do Teddy's bidding, the big man would be re-admitted to the insane asylum. Finally of course, Norman did break free of Teddy's evil grasp. While still under Long's tutelage, fans would bring Norman teddy bears, which set Long off too. 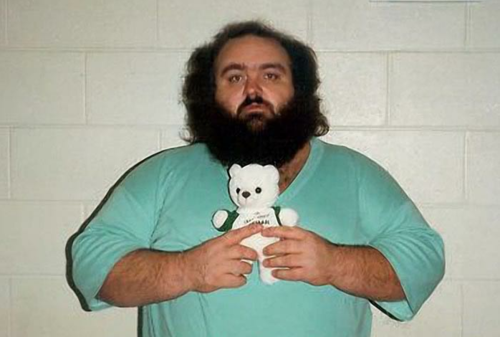 Even "Dr. Death" Steve Williams presented the lunatic with a bear. As a face, Norman (real name Mike Shaw) dropped the lunatic from his moniker and just wrestled as Norman. It was very similar to the George "The Animal" Steele face turn in the mid 80's in the WWF. He became that character fans could get behind and feel sorry for. Eventually, Norman got a job as a truck driver, which was a tribute to Shaw's dad. In 1993, he would head to WWF, where he shaved his mangy hair and became Friar Ferguson. 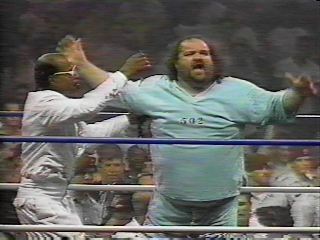 It was a gimmick that literally lasted weeks, before he became Bastion Booger. While he probably enjoyed his most success while in Stampede, he became better known after his stints in NWA and the WWF. Sadly, Shaw died in 2010 after suffering a heart attack. He was only 53 years old. But let's remember the good times Shaw provide fans. While Norman may have never held gold during his run in the NWA, he definitely won the hearts of the fans after changing his ways and feuding with Teddy Long and Kevin Sullivan.